Despite years of campaigning from architects and heritage bodies, demolition is now underway on Robin Hood Gardens, the post-war housing estate in east London designed by exponents of new brutalism, Alison and Peter Smithson. 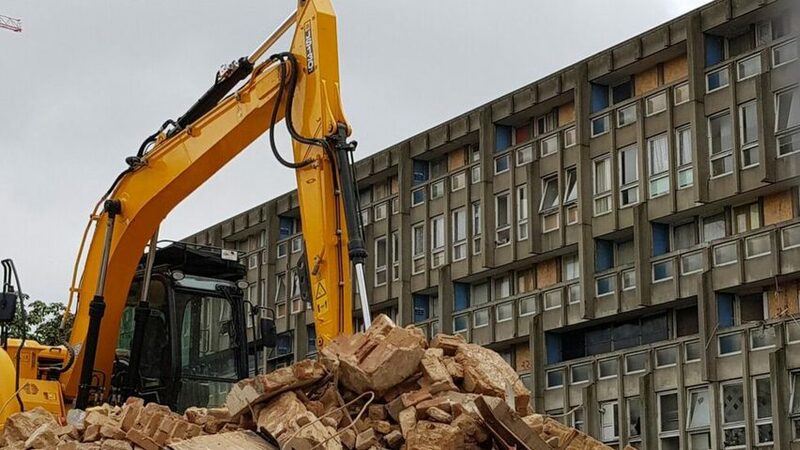 Images showing the the historic 1970s housing estate being pulled down began appearing on social media earlier this week, although its demolition has been on the cards for over a decade. The brutalist estate will be demolished in sections, with the western block going first. Residents of this block have long been evicted, but the eastern block is still occupied and will be pulled down later. In 2009, the government granted Robin Hood Gardens a five-year immunity from being considered for listing, allowing local council Tower Hamlets to give the go-ahead for its demolition, despite a high-profile preservation campaign backed by prominent architects. Richard Rogers, the late Zaha Hadid, Robert Venturi and Toyo Ito all protested against the destruction of the complex, which was the only housing estate designed by husband-and-wife duo Peter Smithson (1923-2003) and Alison Smithson (1928-1993). Once that five-year period came to an end in 2014, the Twentieth Century Society revived its earlier campaign to have the building saved. Its report claimed that the decision not to protect the estate with a formal heritage listing the first time around was ill-judged, and it attracted the backing of Rogers and his colleague Simon Smithson – the son of the building's architects. Post-war architecture and Smithons expert Dirk van den Heuvel, also lent his name in support, describing the estate as a "rare, majestic gesture, both radical and generation in its aspiration for an architecture of human association". But ultimately the campaign failed for a second time and the developer Swan Housing Association with the backing of Tower Hamlets council revealed its plans for a new housing estate named Blackwall Reach. Completed in 1972, Robin Hood Gardens is based on the concept of "streets in the sky" and features rows of elevated walkways that aim to recreate the atmosphere of terraced houses above street level. Its two concrete slab blocks, containing 2013 apartments, angle around a grassy mound in the centre of the development, a haven from the main roads running directly past the estate. The estate was deemed "bleak" by Emily Gee, the designation head at listing body Historic England, and not worthy of preserving. "It was not innovative in its design – by the time the building was completed in 1972 the 'streets-in-the-air' approach was at least 20 years old," said a statement from Gee released by the hertiage body in 2015. "The building has some interesting qualities, such as the landscape, but the architecture is bleak in many areas, particularly in communal spaces, and the status of Alison and Peter Smithson alone cannot override these drawbacks." The two blocks will now be razed and their 214 apartments replaced with 1,575 new homes, designed by a trio of architectural practices: Haworth Tompkins, Metropolitan Workshop and CF Møller. This summer, Dezeen took the opportunity to film the estate before demolition began. The footage shows the estate partially deserted and boarded up in preparation. Earlier this month, Dezeen spoke to Simon Smithson about the imminent demolition. He described it as an "act of vandalism" and attacked politicians for tampering with the heritage-listing system in a bid to to erase examples of the UK's post-war architecture. He questioned not only Historic England's decision not to list his parents' estate, but the dearth of post-war housing on the list in general.